The opening statements in the trial of ex-NFL player Aaron Hernandez were finally heard Thursday after a two-day blizzard delay and another three-hour delay Thursday morning when one of the 18 jurors was late to court and another sent a note to the judge, according to a report on nesn.com. Hernandez, who last played for the New England Patriots as a tight end in 2012, is charged with killing Odin Lloyd, a 27-year-old semi-pro football player from Boston who was dating the sister of Hernandez’s fiancee, Shayanna Jenkins. At the time of Lloyd’s murder, June 17, 2013, Hernandez had a $40 million contract with the Patriots and had emerged as one of the better tight ends in the league. According to the report, Assistant District Attorney Patrick Bomberg’s opening statement Thursday morning detailed the time-line of events and mapped out the route Hernandez and his co-defendants took on June 17, using surveillance video and texts to show Hernandez was upset with Lloyd and the cover-up that followed. Bomberg said Hernandez called two friends, Carlos Ortiz and Ernest Wallace, to his home (in North Attleborough, Mass.) before picking up Lloyd, and the three of them took Lloyd to an industrial park in North Attleborough and shot him six times at 2:30 a.m. Furthermore, Bomberg said surveillance videos show Hernandez, Wallace, and Ortiz going back to Hernandez’s house on the night of the killing and that Hernandez had a gun. A toll camera caught Hernandez’s rental car running through a toll, without paying, on that same night. According to the report, prosecutors haven’t said who actually shot Lloyd but Hernandez was the orchestrator. Both Ortiz and Wallace have pleaded not guilty to murder charges and will be tried separately. Among the nearly 300 people on the prosecution’s list of potential witnesses are Patriots head coach Bill Belichick and owner Robert Kraft. Another potential witness is Hernandez’s fiancée. According to prosecutors, Jenkins has lied to the grand jury numerous times about Lloyd’s killing. She testified that she couldn’t remember where she disposed of a large box from the basement of their home that Hernandez allegedly told her to get rid of. 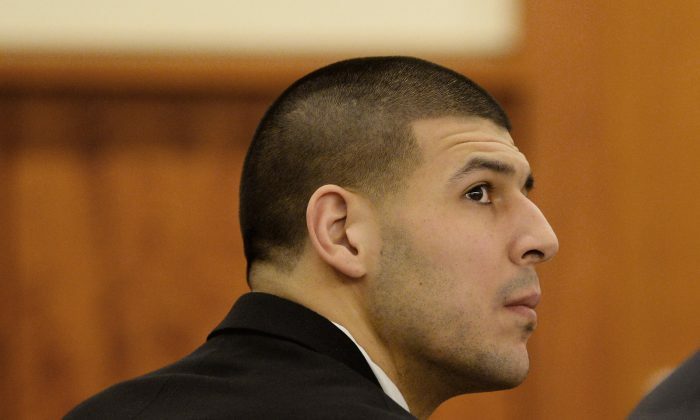 The Hernandez trial is expected to last six to ten weeks but is not the only legal trouble facing the ex-NFL player. The 25-year-old faces a separate murder charge from 2012. In that case, he is accused of killing two men after one of them accidentally spilled a drink on him at a nightclub.